It was unlike any mountain path we had walked before. 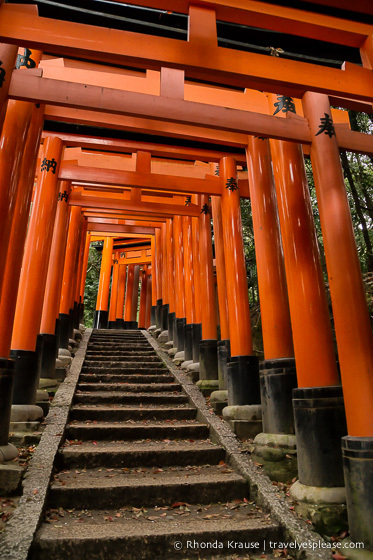 Thousands of vermilion coloured torii gates lined the way, sheltering us from the forests of sacred Mount Inari. On and on we walked, through the seemingly never-ending tunnel of gates of Kyoto’s Fushimi Inari Shrine. The further we walked, the older and less dense the gates became. Torii that were once shiny and bright, have dulled and weathered over time. About half the way up the mountain we reach an opening- the Yotsutsuji intersection. Sitting down to enjoy the views of Kyoto, we wondered if we should continue on to the top of the mountain. Hunger was setting in, our feet were aching and the sun was starting to go down. We decided it was best if we turned back. So down we walked, through the same tunnel of gates, the path a little darker than before. We may not have reached the top of Mount Inari, but we still got to experience the famous Fushimi Inari Shrine, one of Kyoto’s most popular attractions! Fushimi Inari Shrine is the most important shrine of about 30,000 across Japan dedicated to Inari, the Shinto god of rice. The shrine dates back to the 8th century, when agriculture played a large role in Japanese life. Eventually, agriculture became less important and business became the route to prosperity. Inari, still the god of rice, took on the modern role of ensuring success in business. A rope made of twisted rice straw (called shimenawa) is hung over shrine entrances to separate sacred and secular places. 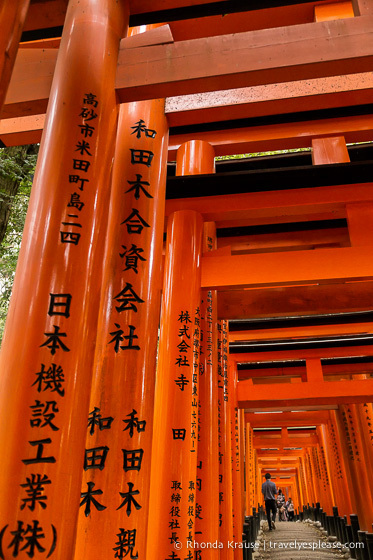 Over the years, companies and businessmen donated torii gates to honour Inari. There are now thousands of these gates lining the path up Mt. Inari. Each gate is inscribed with the donor’s name and date it was donated. Not just anybody can donate a gate, though. You have to have 40,000 yen to spare for a small gate, or over a million for a large one! Besides torii gates, you’ll also see a lot of stone foxes at Fushimi Inari Shrine. Some are along the mountain path, but most prominently they stand guard at the shrine’s main gate. In Shinto religion, it’s believed that foxes are the messengers of Inari. I had high expectations about our visit to Fushimi Inari Shrine. So many other bloggers had written posts saying this was their favourite place in Kyoto, if not Japan. My guidebook even called it mesmerizing. With all that praise, Fushimi Inari Shrine quickly became one of the places I was most looking forward to visiting in Kyoto. So, why then was I a little frustrated during our visit? The masses of people stopping to take selfies in the middle of the path had something to do with it. But beyond that, I felt like something was missing. Here I was in this unique, culturally important place and I wasn’t feeling anything. I wanted to feel something. Just what exactly, I’m not sure, but something more…special. Instead, I just felt like we were going through the motions. On and on we walked up this path for no real reason, but to just walk. There was no scenic view until we got to the halfway point. The torii, while interesting at first, quickly started to seem ordinary, even though this place is anything but ordinary. As for the inscriptions on the gates, I had just assumed they were some sort of spiritual message to Inari. Finding out they were really the names of businesses and donors left me a little disappointed. I don’t know why I was disappointed- it wasn’t like I could read the inscriptions anyways. I guess it’s because if I could have read them, I would have felt like I was walking through a giant advertisement tunnel! But hey, if I paid 40,000 yen for a gate, I’d want my name on it too! Fushimi Inari Shrine was beautiful and the path of torii gates was truly unique- definitely a sight worth seeing! Yet, overall I’d say our visit to Fushimi Inari Shrine was just okay. The shrine may not have made as big of an impression as I was hoping for, but I don’t regret visiting at all. There were just other places I connected more with during our three days in Kyoto. Fushimi Inari Shrine is in southeast Kyoto. To get there from Kyoto Station, take the JR Nara line to Inari Station (5 minute ride). The shrine is just outside the station and you’ll see it straight ahead once you arrive. The shrine is open 24 hours, every day. The pathway to the top of the mountain is 4 kilometers and takes about 2-3 hours, round trip. It’s about 30-45 minutes to Yotsutsuji intersection, where we decided to turn around. If you continue beyond the intersection, the path splits into two making a circular route to the summit. There are some places to stop and get food along the way. Since we visited late in the day, food places were already closed or closing. Don’t bother trying to take pictures near the bottom of the path. Everyone goes crazy with their cameras here! You’ll get better pictures further up the path, as the crowds thin out.